SolarWinds scalability engines have been designed to provide monitoring and management for large enterprise-class infrastructures. 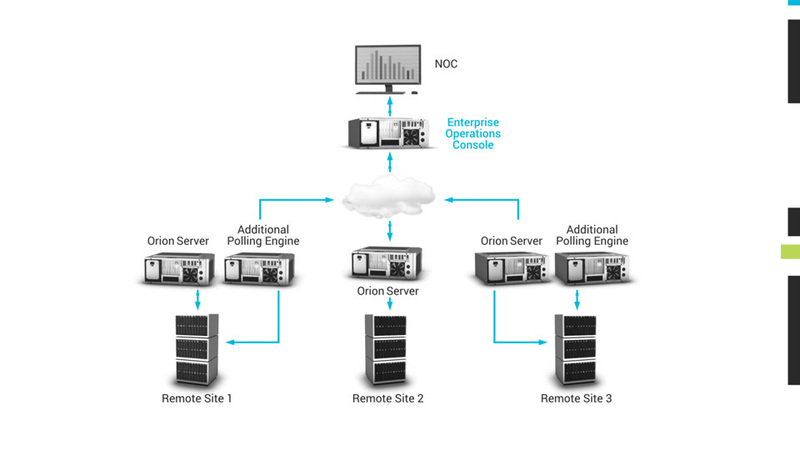 Additional polling engines allow you to scale up to 400,000 elements on a single Orion® Platform instance while additional web servers scale the number of supported users. With Enterprise Operations Console (EOC), you can centralize and simplify data management of multiple instances in a single, consolidated view. SolarWinds scalability engines provide capacity, performance, and deployment options for environments of all sizes. Increase the monitoring capacity of your Orion® Platform instance by adding additional polling engines to the main poller. Improve web console performance by load-balancing large numbers of users with additional web servers. Deploy your Orion Platform instance centrally by polling from your main data center. Add additional polling engines to your remote sites for enhanced visibility, or install an Orion Platform instance in each of your remote sites and aggregate the data with Enterprise Operations Console for a consolidated view. SolarWinds gives you scalable performance monitoring for your entire IT infrastructure.